Hailing from Chuncheon in South Korea, Heung-Min Son was 16 years of age when he left school and upped sticks to Germany to join Hamburger SV's youth academy. It was the start of a fantastic relationship between the player and German football. After steady progression in the Hamburg youth team, he was drafted into the senior squad at the beginning of the 2010/11 season. Injury meant he missed the start of the campaign, but the talented forward would not be denied. He came back strongly to make his senior competitive debut in a DFB Cup match against Eintracht Frankfurt on 27 October. Just three days later, the livewire attacker netted on his Bundesliga debut against 1. FC Köln, making the then 18-year-old the youngest Bundesliga scorer for HSV since club legend Manfred Kaltz. He had fully justified the "gem of a striker" tag given to him by then head coach Armin Veh. Further injuries restricted Son's involvement in the 2011/12 campaign, but he still managed 27 appearances and five crucial Bundesliga goals for HSV, helping the club maintain their status as the only ever-present Bundesliga side. Son enjoyed his most fruitful top-flight campaign in 2012/13, scoring twelve times to help HSV to a seventh-place finish, a return which caught the eye of Bayern 04 Leverkusen, who secured his services on a five-year deal in June 2013 and gave him his first tastes of UEFA Champions League football in 2013/14. Having forged a reputation for himself in Germany, it wasn't long before he tasted international football. 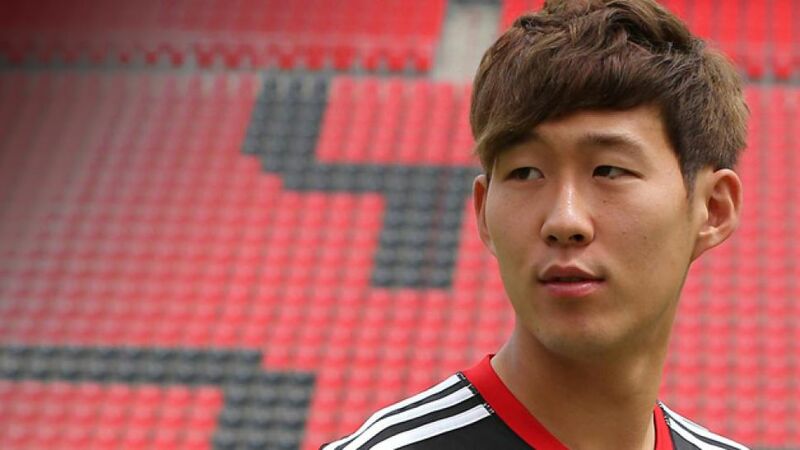 The prodigy made his debut for the South Korean team in December 2010 and scored his first goal in the 2011 Asian Cup. At the 2014 FIFA World Cup, Son failed to fire his side past the group stages, but he'll undoubtedly be showcasing the talents Bundesliga defenders know - and fear - all too well again in 2014/15.